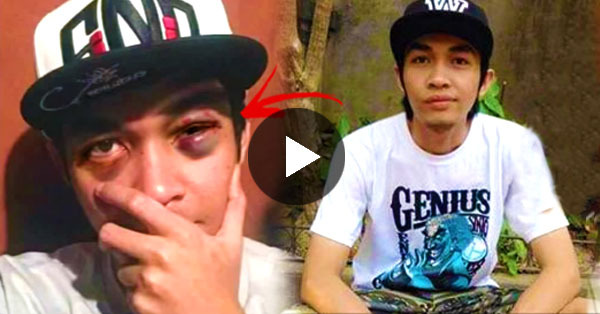 Was Fliptop Emcee Sinio Ambushed up During an Event? Find Out What Really Happened Here! In recent news, Fliptop emcee Sinio has been at the center of social media buzz after his controversial (some would argue derogatory), battle against Shehyee. Specifically, it was his comments toward’s Shehyee’s girlfriend, Ann B. Mateo, that has stirred up this fued. Naturally, this led Mateo’s family to file slander charges against Sinio. Now, Sinio has become a trending topic in social media after a picture of the emcee with what appears to be a black eye had begun to circulate online. Rumors and gossip circulated in the Fliptop community that say Sinio was beaten up at an event. In an equally viral video by Youtube channel Hiphop Fanatic, it was unveiled that the viral picture was not all as it seemed. Watch the video with details below! As it turns out, the viral photo was nothing more than an elaborate photoshop job. Apparently, it was either a joke or a publicity move by either Sinio, the other camp or some random fan. Sorry for wasting your time. Sinio is fine. Did you enjoy that story? Tell us what you really felt in the comments section! Remember to share this with your other friends on Facebook!